Feeling tired? Emotionally, spiritually, physically – tired. For I know Whom I have believed and am persuaded that He is able. Able to do exceedingly abundantly above all that we ask or think. Able to make all grace abound toward you, that you, always having sufficiency in all things, may have an abundance for every good work. "According to your faith let it be to you." really lovely blooms and trellises! love the gate and doorway, too! thank you for linking up! Beautiful images of the clematis winding through the trellis! I love this post, love your words and your lovely pictures: your gorgeous clematis really looks like the Faith should have to be ... strong, steady, sturdy, always in full blooming ! Hi June Great words to be encouraged by. Love the Clematis on the trellis fence. Gorgeous, gorgeous photos of the fence and clematis. 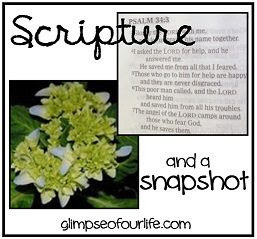 Love the scriptures, enjoyed my visit to your blog. Beautiful blossoms and a very pretty colour. Beautiful images to accompany such reassuring Scripture texts. 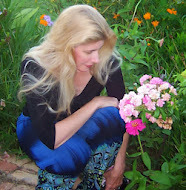 The flowers are so pretty that I do believe I can remember their scent! Great closing fence photo too! The clematis is so beautiful! I've heard of them but never seen them. Those centers are truly dazzling. Have a blessed weekend, June! Gorgeous blooms, so much pretty purple....it just so happens to be my favorite color!! Such beautiful light illuminating the clematis!! I love that verse and the old hymn. That's a good thing to have stuck in my head. And those purple flowers are amazing. OMG; what beautiful pictures and graceful words. Purple is considered noble color here in Japan. Such wonderful scriptures! I don't think I've ever seen a purple clematis. How wonderfully gorgeous! Beautiful photos with the assurance of God's promises! All I can count on forever is His "Ability"... He can break through anything and pour blessings through and through and through us. Keeps us moving along, b/c HE is Able and we are filled with ability through Him. Love your photos, BTW. My favorite colors. Beautiful pictures! Loved the reminder that we serve a God who is ABLE!